Villa Kokoros holiday apartments are a family run business, situated in the small, quite and unspoilt village of Agios Vasileios. 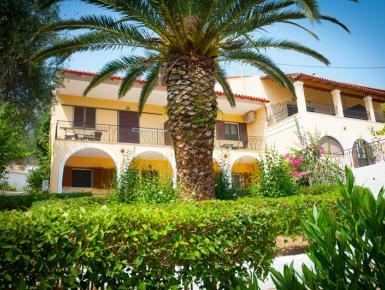 The apartments are 14 kilometres from Corfu Town and the airport and 2 kilometres from the island’s esplanade road, which runs close to some of its most beautiful beaches located in the East side of the island. The nearest beach of Dassia lies just about 2kms away. The apartments are situated in a 2000 square meters land scape. The rich garden planted with olive, orange, mandarin, lemon and mulberry trees, as well as many ornamental flowers and bushes. All these provide various shady nooks, ideal for rest and relaxation.